Green Meadow kindergarten teacher Erin Tarbox holding her daughter Brinley and surrounded by friends with Brinley’s Bags. Green Meadow kindergarten teacher Erin Tarbox turned a frightening experience this past spring into a selfless gift to others. It was a stressful and challenging time for Mrs. Tarbox and her husband Chris, who visited Brinley every day. 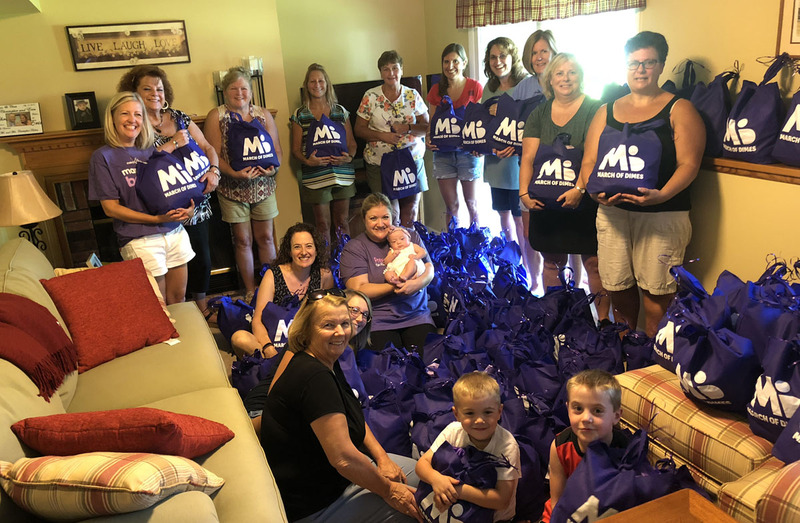 After going through that experience, Mrs. Tarbox decided that she wanted to create care packages for the other families in the NICU to make life a little easier on them. 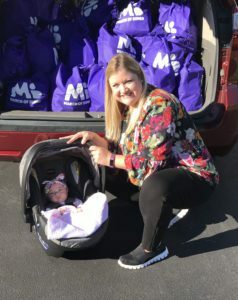 Mrs. Tarbox teamed up with the March of Dimes and then reached out to friends on Facebook to see if anyone would donate items for the bags. So far, 110 Brinley’s Bags have been donated, and Mrs. Tarbox is planning to make 180 more for local NICUs after the holidays in January. Erin Tarbox with her baby Brinley. Most of the donations came from East Greenbush families – fellow teachers and staff, students and their parents. Each bag includes toiletries, water, snacks, a journal and gift cards to places such as Dunkin Donuts and Starbucks. Each bag also has a letter from Erin and Chris Tarbox that shares their story and some helpful advice for parents. Now seven months old, Brinley Tarbox is healthy and doing well at home. And Mrs. Tarbox is grateful to everyone who has supported her family and Brinley’s Bags. Mrs. Tarbox is scheduled to return to school on January 2.